Worldwide, a large majority of organizations developing systems or software are very small entities (VSEs), enterprises, projects or public organizations having up to 25 people. With the ISO/IEC 29110 series of standards and guides, VSEs now have documented development processes and third-party certification helping them to be recognized as entities that produce quality systems or software products. After the establishment of WG 24 in 2005, members of WG 24 conducted an international survey to question VSEs about their utilization of ISO/IEC JTC 1/SC 7 standards and to collect data to identify problems and potential solutions to help them apply these standards. Respondents to the survey indicated that they did not have the resources or the expertise to adapt existing standards to their needs and, standards were difficult and bureaucratic and they did not provide adequate guidance for use by VSEs. A large percentage of respondents also indicated that they would like more guidance with examples, lightweight and easy-to-understand standards, complete with templates. The ISO 29110 series targets VSEs with little or no experience or expertise in selecting the appropriate processes from systems or software engineering lifecycle standards tailoring and documenting them (e.g. with activities and tasks, inputs/outputs and roles) to a project’s needs. 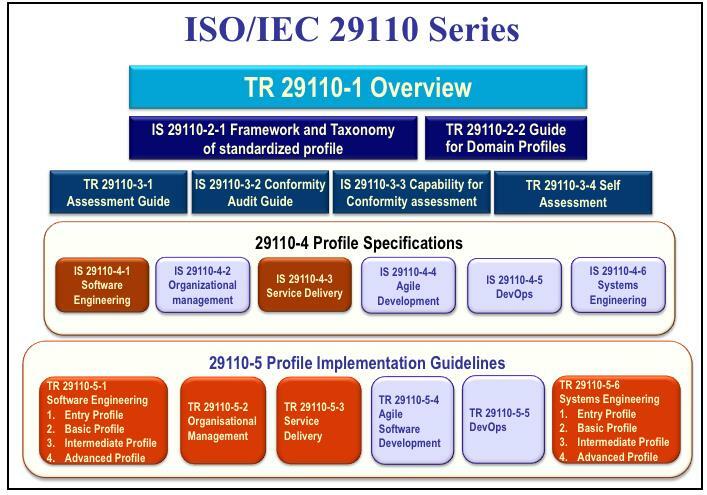 Once established, the ISO/IEC JTC1 SC 7 Working Group 24 took an innovative approach, using standardized profiles, to develop the set of ISO/IEC 29110 standards and guides. WG 24 re-used elements of published engineering standards (such as ISO/IEC/IEEE 15288 or 12207), to develop a four-stage road map for Start-ups to Grown-ups VSEs (Entry, Basic, Intermediate, and Advanced). The profiles are applicable to the vast majority of VSEs that don’t develop critical systems or critical software. The core of ISO/IEC 29110 are the Management and Engineering Guides (i.e. ISO/IEC 29110-5-1 and ISO/IEC 29110-5-6) providing project management and systems and software engineering processes. Some ISO/IEC 29110 documents, such as the overview and the Management and Engineering Guides, are freely available from ISO. They’ve been translated into Czech, French, Portuguese, and Spanish and adopted as national standards by several countries. Recently, ISO has even published an ISO 29110 document in Spanish. “In addition to developing and selling their own products, VSEs can also develop and/or maintain systems or software, having hardware and/or software components, that are used in larger systems; therefore, recognition of VSEs as suppliers of high quality systems or software is often required” says Dr. Claude Y Laporte, Lead Editor of ISO/IEC JTC1 WG 24. A recent pilot projects, with six engineering SMEs and VSEs of the south of France, implemented an ISO 29110 Systems Engineering and Management Guide. This guide is mainly based of the ISO/IEC/IEEE 15288 standard. The six enterprises, established between 1994 and 2016, are operating in a wide range of domains, such as agriculture, automotive, nuclear, space, and have a size ranging 10 to 150 people. Many benefits (e.g. better risk management, fewer errors and reduction of the cost of errors, detection/correction of errors early in the project, shorter validation time, and reduction of the number of incidents at integration) have resulted from the implementation of the systems engineering guide of ISO 29110. ISO 29110, over 10 universities are teaching ISO 29110. So far, about 450 public and private Thai organizations have achieved the ISO 29110 certification to the basic profile. A second survey was conducted, by members of WG 24, in 2018. The responses collected indicated a high level of satisfaction of VSEs and their customers about ISO 29110. As an example, to the question “How long, after you implemented ISO/IEC 29110, did you notice any improvement”, over 64% of respondents noted improvements in productivity, 58% in quality in the first six months after the implementation of ISO 29110. Over 89% of respondents are completely or largely satisfied with their ISO 29110 implementation. A large percentage of customers of VSEs (79%) were completely and largely satisfied with the results of the system/software/service provided. WG 24 will use the results of the 2018 survey as one input to guide the revision of the ISO 29110 series of standards and guides. WG 24 is presently developing standards and guides to address Agile and DevOps development. Experts of WG 24 are also investigating the development of a guide to help VSEs in implementing quality requirements (i.e. usability, security) and measures from the ISO/IEC 25000 and ISO/IEC 27000 series. The ISO/IEC 29110 series of Standards and Guides has helped to reduce the difficulty of VSEs in applying SC 7 standards and justifying the application of those standards to their business needs and practices. “ISO 29110 helps meet the need for VSEs’ specific systems and software lifecycle profiles and guidelines”, says Tanin Uthayana, Convenor of WG 24 – ISO/IEC JTC 1/SC 7.